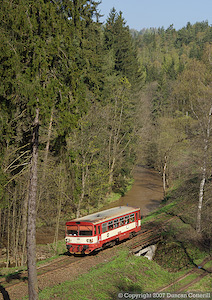 On 3 May 2006 there was barely enough room between the trees to photograph a 4-wheel railbus on the big curve north of Jamne nad Orlici. 810.655 was working Os 20006 from Stity to Letohrad. A little less than a year later the same position was wide open with nothing more than a few shadows to worry about. 751 176 and 751 354 led a southbound freight around the curve north of Jamne nad Orlici on 20 April 2007. Nice though the Letohrad 751s are, there's not a lot of variety in the liveries. 751 354 brought a welcome splash of colour to the line with it's modified red, white and yellow paint scheme. It's seen here leaving Letohrad with 751 176 and a freight to Miedzylesie on 20 April 2007. 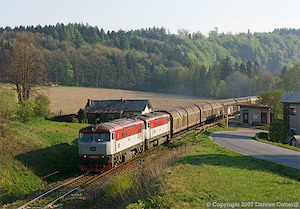 749 011 and 749 019 took the short climb through Vermerovice in their stride as they hurried towards Letohrad with a train of vans on 28 April 2007. This location in the Ticha Orlice valley north of Jamne nad Orlici was overgrown and impossible to photograph a year ago, but not any more. 751 038 and 751 236 rolled southwards along the recently cleared embankment with a train of gas tanks on 27 April 2007. 749 019 and 749 011 were working flat out as they were photographed passing this trackside house south of Mladkov on 28 April 2007. On Saturdays and Sundays a class 854 railcar runs from Pardubice to Hanusovice and back via the Letohrad to Lichkov line. 854 022 worked train Sp 1908 through Techonin on its way back to Pardubice on 29 April 2007. 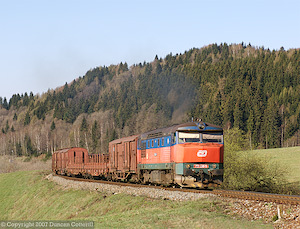 742 113 left Dolni Lipka with a single empty wagon for the timber yard at Cerveny Potok on 28 April 2007 . Sumperk's engines are as colourful as Letohrad's are conventional. Green and cream 749 250 is not alone in carrying a non-standard paint scheme either. 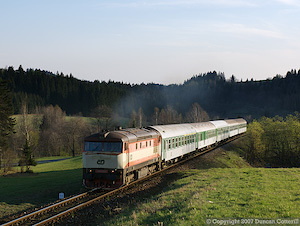 The loco was photographed approaching Ostruzna with R906, the 14:35 Jesenik - Brno passenger, on 22 April 2007. The December 2006 timetable change saw the resumption of passenger services to Poland via the Glucholazy border crossing. Initially the service only operated at weekends but daily trains are planned over the summer period. 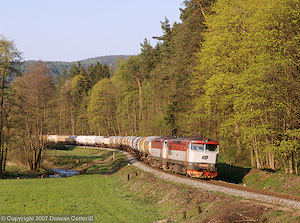 749 246 rounded the horseshoe curve below Horni Lipova with Sp1803 from Ostruzna to Opole on 22 April 2007. Sumperk's superb red and blue 751s work much of the freight traffic on the Jesenik line. 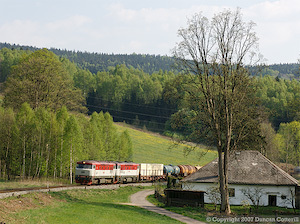 751 338 was climbing from Branna to Ostruzna with the morning freight for Javornik ve Slesku on 23 April 2007. The addition of an evening northbound loco-hauled passenger has opened up some welcome new photographic possibilities. 749 248 passed one such spot with R903, the 15:19 Brno - Jesenik at last light on 23 April 2007. The driver of 831 233 got the right away from the red hat at Branna on 25 April 2007. 749 250 rolled into Branna with R906 to Brno, passing 749 246 waiting in the loop with northbound freight Mn81761 on 26 April 2007. This report covers a 10-day photographic trip to the Czech Republic in late April 2007. The dates had been pencilled in long ago but without any specific destinations in mind. It then became clear that the start of electrification work on the Letohrad – Lichkov – Miedzylesie (PKP) route would be delayed from the end of March until early May. The news that the lineside was being cleared of vegetation in advance of the poles going up convinced me that the line was worth another visit. Looking at the timetable also convinced me that the trip would need to be done by car. The passenger service is now so sparse in the morning that getting to many locations by rail is impractical. Ten days on Letohrad – Lichkov seemed too long and there were daytime closures from Monday 23rd to Thursday 26th April so those four days were spent on the splendid Hanusovice – Jesenik line nearby. I flew with BA from Heathrow to Praha on the evening of 19 April, returning home at lunchtime on 30 April. This line forms part of a major freight corridor between Wien and Brno to the south and central Poland to the north. Most of the route is electrified but the 30 km section from Letohrad to Lichkov and across the border to Miedzylesie in Poland is still diesel worked and runs through superb scenery. Diesel hauled heavy freights are now a rarity in the Czech Republic and this is one of the few lines with reasonably heavy traffic levels. Another major attraction is the use of pairs of class 751 locos although sadly all of Letohrad’s engines are silenced. Traffic levels were good during my visit with around six freight workings on most days. Timings were a bit erratic but the pattern of trains published on www.bahnfuhrer.wz.cz (since discontinued) was a good guide most of the time. Even when things went astray it was usually possible to work out what might happen from the disposition of locos and the available gaps in the passenger service. Regular pairings of locos were 751 038 + 751 236, 749 011 + 749 019 and 751 080 + 751 104. 751 080 was in deplorable external condition but seemed to go well enough. 751 176 was also a regular but its partners varied from day to day and included 751 094 and 751 354. It was even paired with 751 038 for a day while 751 236 received attention. In addition to the long distance freights, there was a class 742 hauled pick-up goods every day except Sundays. The train left Letohrad in the early morning and serviced customers on the Lichkov line, the Stity branch and the wood yard at Cerveny Potok on the Hanusovice line. It returned to Letohrad during the afternoon. 742 113 and 742 202 took it in turns to work this train. There was also a locomotive hauled passenger service, R250 and R251 linking Poznan with Praha. This had originally been due to cease on 31 March but was then extended until 5 May. After that it will become a Letohrad – Praha and return service. From the December 2006 timetable change, Letohrad’s class 749s were replaced on passenger work by class 750s and 754s. This was a retrograde step from a photographer’s perspective as several of the 749s were kept in very nice condition. The 750s and 754s seen were all painted in the standard drab grey/green livery and none were particularly clean. Fortunately 749 011 and 749 019 were still extremely well looked after and were a common sight on freight workings. Locos seen on R250 and R251 were 750 160, 750 258, 750 259, 750 312, 754 030. The other loco hauled passenger that used to run was a daily working to Jesenik and back but that ceased with the December 2006 timetable change. There are now no loco hauled passengers between Hanusovice and Lichkov although every Saturday and Sunday a class 854 railcar works Sp1909 from Pardubice to Hanusovice in the morning and returns on Sp1908 in the afternoon. During the day it fills in by shuttling between Hanusovice and Dolni Lipka, treating the local population to unaccustomed luxury. Apart from trains R250, R251 and the weekend 854 turns, all passenger workings between Letohrad, Lichkov and Dolni Lipka, on the Hanusovice line and the Stity branch were handled by class 810 4-wheel railbuses. The trackside vegetation clearance has opened up many photographic locations that were hopelessly overgrown for years. At the time of my visit only the section from Letohrad to Jablonne nad Orlici remained to be cleared. Further north there were numerous positions in places that didn't seem possible a year ago. The Lichkov - Miedzylesie section was due to close for electrification work in early May 2007 so the window of opportunity to take advantage of the new spots was very short. In six days on the line, there was only one morning of cloudy weather. The rest of the time the sky was predominantly clear blue and the light was exceptionally clear. There was a cold northerly wind much of the time but if that was the price for good light, it was well worth paying. This is one of the most scenic and photogenic railways in the Czech Republic. It features a long climb from Hanusovice to a summit at Ramzova before dropping to Jesenik, close to the Polish border. En route, the line twists through narrow river valleys and runs across open upland meadows, through dark forests and around horseshoe curves. In short, it's a real gem. Recent years have seen a steady decline in the number of diesel hauled passengers on the Czech system and the locos of class 749 have borne the brunt of the cuts. Surprisingly, the number of loco hauled passengers on the Jesenik line has actually increased this year. There are now three daily return workings from Zabreh nad Morave to Jesenik and back, all booked for class 749 haulage. Also new this year is a Saturday and Sunday only working from Opole in Poland to Ostruzna and back. During my visit, there was also an unexpected loco hauled working from Olomouc to Jesenik and back every day. 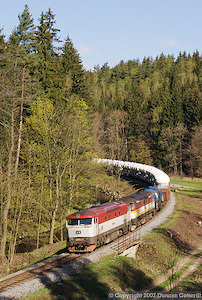 The reason for the increase in loco hauled workings is the introduction of more through trains between Brno and Jesenik, essentially as an extension of the Brno – Olomouc service. There are also more through trains with class 843 units between Olomouc and Jesenik, giving the line a much better service overall. The 843s also now work a number of local passengers between Jesenik and Hanusovice or Sumperk. In spite of the increased use class 843s, the older class 831 railcars were still working four trains over the pass. Os3605, Os3608, Os3615 and Os3684 were covered by 831s on weekdays, as were Os3613 and Os3610, which only run as far north as Branna. Class 851 units are much less common but still visit Jesenik at weekends and continue to work a number of services south of Hanusovice. Os3615 was an 851 on Sunday 22 April. Os3628 was seen with an 851 south of Hanusovice on 26 April. While class 810s are not completely absent, they do only work a handful of trains north of Hanusovice. The two booked daily passenger turns between Jesenik and Zabreh nad Morave on the Brno trains, i.e. covering R902, R907 and R908 one day and R909, R906 and R903 the next, were worked by 749 250 and 749 248. The Ostruzna – Opole train was worked by 749 246 on Sunday 22 April. The train appeared to stable at Ostruzna between workings. The additional loco hauled turn covered Sp1705 from Olomouc to Jesenik and Os3612 return during the week. On Sunday 22 April the outward working wasn’t seen but the return train was Sp1704, essentially in the same path as Os3612. Motive power was 749 264 (22-24 April) and 749 256 (25-26 April). As on my previous visit, the freights ran like clockwork most of the time with the two daytime northbounds, Mn81821 and Mn81761, being absolutely dependable. The afternoon southbound, Mn81830, was more erratic and, although it usually left Lipova Lazne at around the expected time, it then tended to run much earlier than the times published on www.bahnfuhrer.wz.cz (since discontinued), i.e. without the long layover at Horni Lipova. Locos 751 041 and 751 338 worked turn about until 25 April when 751 335 replaced 751 041. 751 338 was replaced by 749 246 on 26 April. Photographically the line was as good as ever and the lineside seemed remarkably clear of extraneous vegetation in most of the prime spots. The weather was good here as well with one partly cloudy day and the other three gloriously clear. The morning of 29 April was overcast on the Letohrad - Lichkov line but conditions looked better further south. I went to have a look at the recently rebuilt main line between Trebovice and Rudoltice, east of Ceska Trebova. Nothing unexpected was seen in the couple of hours I was there. 151 007 and 151 008 worked EC128 and EC121 respectively. 162 035 and 162 040 worked R704 and R627 respectively and 363 003, 163 015 and 130 030 were seen on freights. Two freights were banked, both downhill! Presumably the concern was braking as one of the bankers came back light engine. The bankers were 130 003 and 363 005. Wow, what a trip! Near perfect weather, wonderful scenery, excellent locations and plenty of trains. What more could a gricer want? The clearance work on the Letohrad - Lichkov line transformed it from a pleasant but difficult route to a photographic paradise. In spite of spending six days on the line, I still didn't get all the shots available and could have happily spent another two or three days there. The chances of getting any more diesel hauled freights before the poles go up is slight but I'm looking forward to returning one day to photograph electrics. Hopefully the passenger service will also benefit from electrification, with loco hauled trains replacing the 4-wheel railbuses, as far as Lichkov at least. While the Lichkov route is being electrified, freights between Ceska Trebova and Wroclaw will be diverted via the Tyniste nad Orlici to Mezimesti line. This route is fairly scenic north of Nachod and many of the local passengers are worked by class 714 diesels. Definitely a destination for later this year. 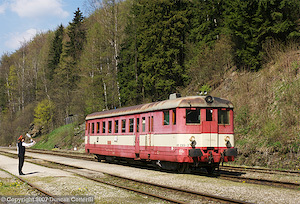 Time may have run out for diesels on the Lichkov route but the show continues on the Jesenik line. Not only has the service increased but the loco hauled trains are generally well timed for the light with nothing going north in the middle of the day when the sun is difficult. As well as the loco hauled workings, the 831s and occasional 851 add to the interest. How long the current situation will continue is uncertain. It may last for years but it's more likely that things will change before too long. It's always possible that next year the hauled trains may be worked by class 750s and 754s and the 831s replaced by 814s. If you want to see the best diesel action in the Czech Republic, try to visit the Jesenik line this year. Most of my recent Czech trips have been done by train using a Sitove Jizdenka network ticket but this time I hired a car. There's no doubt that I got quite a few shots on the Letohrad - Lichkov line that wouldn't have been possible if I'd been travelling by train. On the Jesenik line, the car gave added flexibility but there wasn't really anything that I couldn't have done by walking from the nearest station. What I would have missed out on was breakfast every morning. Had the weather been poor, there's no doubt that I'd have been querying whether the car was worth the extra cost, but the weather was excellent, the shots are in the bag and I have no regrets. I thought that the car would have made travelling from and to Praha much quicker but in practice it didn't save much time at all, even with the new motorway open from Praha to close to Hradec Kralove. Czech trains aren't the fastest in Europe but the roads are slow as well. A car won't save you much time travelling but it does give you control over when you travel and that's important when the next train's three hours away. Accomodation was at the Hotel Filipinum at Jablonne nad Orlici and the Hotel Neubauer at Ramzova. See my previous reports for details.